This sweet and salty stress-free treat is perfect to bring to classroom parties, Easter brunch or any springtime celebration! It can be made in just minutes with only three ingredients. What’s great is that the recipe can be modified to your liking. Want more robin eggs? Toss them in! Just keep in mind this does have to be refrigerated for at least an hour, so plan accordingly. Line the bottom of the baking pan with wax paper. Melt the entire bag of white chocolate chips in a microwave-safe bowl at 50 percent power for 1-1/2 to 2 minutes stirring every 30 seconds. Stir until chocolate is smooth. Break the pretzels into small pieces (less than 1 inch each) and stir into the melted white chocolate. 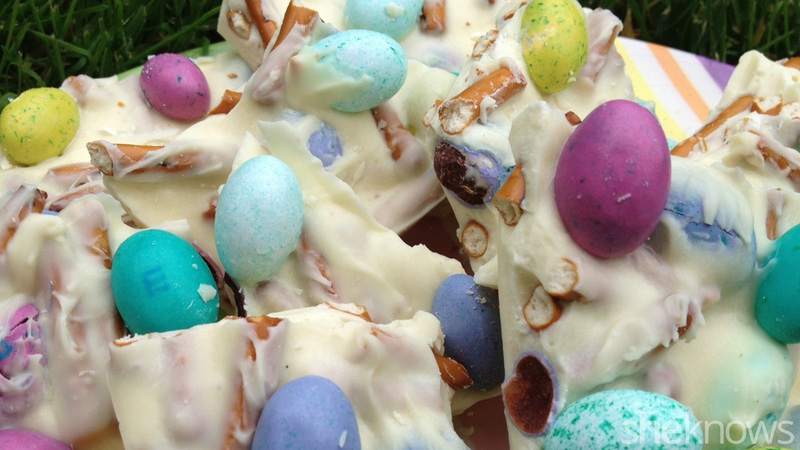 Add half of the M&M’s® or robin eggs to the mixture and stir until evenly distributed. Pour mixture into a wax paper-lined pan and press to the edges so it covers the entire pan. Top with the remaining M&M’s. Refrigerate for at least an hour to set the chocolate. Tip: Prior to serving, break the bark into pieces using your hands. Each piece will be a different shape and size, which is part of the fun!